I had not touched this cookbook in a while until last week. Sometimes some of my cookbooks can be left untouched on shelves for weeks. I just have too many, even if I know this is not paying them justice. Y’en a de trop ! One pile of books seems to always hide another pile, with one book obstructing another one. “I like this cookbook a lot though,” I thought. “Maybe I should place it in the front, not to forget it.” Looking at the elongated shape of that tall, not-your-usual-size cookbook, measuring 11 x 16 inches (28 x 41 cm), I wondered how I could possibly just miss it since trying to put it away anywhere remains a challenge with such an awkward size. When you open it, it takes half of the kitchen table. With beautiful pictures on the right illustrating nicely designed text on the left, this cookbook showcases original recipes, with flavors that transport you in a realm of cooking perhaps never explored, covering many tastes and cultures. There is not a single recipe which I tried from it that was neither wrong nor disappointing. Not difficult ones either. Maybe at times, some recipes needed tiny adjustments here and there, but these were usually only small details fairly easily fixed, in any case. I used my common sense. I could simply not avoid it, even if I wanted to. Because I had such a nice experience picking walnuts at my uncle’s only a few weeks ago, and because they are so seasonal — no surprise then that every cooking magazine I read talks about them — , I started to make a fixation on walnuts. 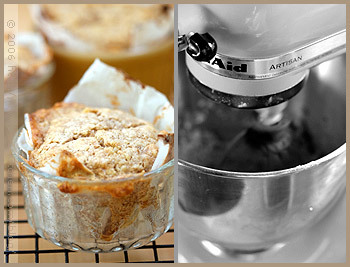 Taking it a step further, I started to obsess about baking walnut cakes. Flipping through the pages of the pile of monthly cooking magazines accumulated by my chair, I found a few recipes that I marked. Initially thrilled to find a good number, many of them unfortunately gave results far from equalling my initial anticipation. The first recipe I tried was just blend in taste, the second one turned into a disaster with an unappealling what-is-supposed-to-look-like-a-cake flat mass. 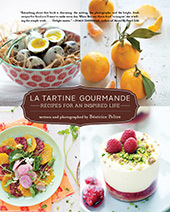 Almost discouraged, I caught a glimpse of Philippe Conticini’s cookbook, Tentations, and decided to look inside. My lucky day! I extracted a wonderful walnut cake recipe. 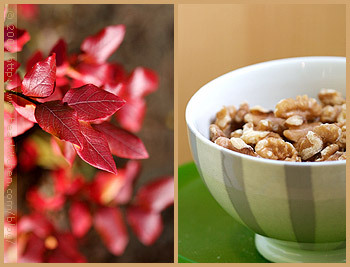 Walnuts are good for our health, providing a lot of good omega 3 fatty acids and vitamin E, to name only a few. A good reason to stock up on them but deep inside, I know this is not necessarily why I like to eat them. They are crunchy — a big plus for me — and make an excellent food snack at any time of the day, preferrably often, even more delicious when toasted in the oven, or flavored with spices. I can never resist walnuts. Why would I? They are even nicer if you can pick them fresh in their shells, when they are still green. We used to make wine with them, du vin de noix, never lasting long, I can tell you that part. But this is a total different subject. I am pressing you to try this recipe. 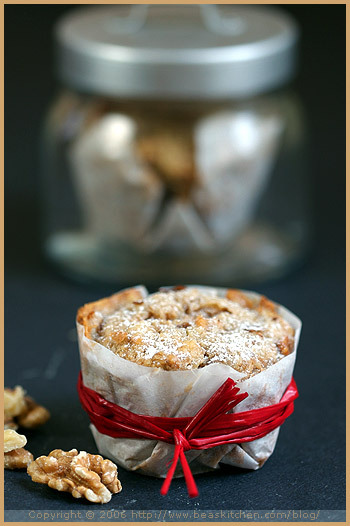 These walnut cakes are simply amazingly good. Moist, light, not airy but crunchy, what can I add to convince you? They require neither flour nor egg yolks, but crunchy little pieces of walnuts lightly wrapped in a batter made of egg whites. Some sugar and butter are added, of course, and that is pretty much it. In a week, I already baked two batches. Walnuts winning over chocolate even, that is saying a lot for P. and I for whom dark chocolate remains a must! 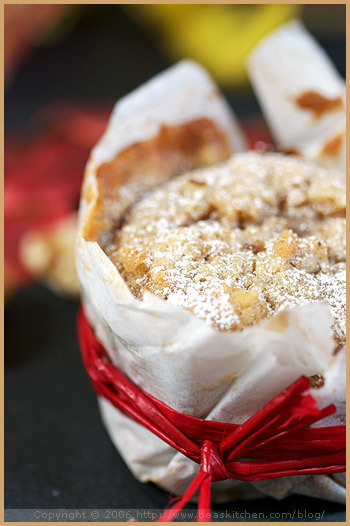 Using a food processor, chop the walnuts coarsely (medium rather than fine) with the confectioner’s sugar . In a bowl, place the soft butter, add the nuts and the raw egg whites, and mix with a whip. Beat 4 egg whites and before they are too firm, add the cane sugar and mix. Fold the whites delicately into the previous preparation. Place pieces of parchment paper at the bottom of ramekins and grease them. Sprinkle with sugar and fill the ramekins with the batter (the cakes will rise slightly). Level the top of the batter with the blade of a knife and place the molds in the preheated oven at 350 F for 20 mns (the recipe indicates 10 mns, but I thought it was not long enough.) Wait for 5 mns before unmolding the cakes. Sprinkle with confectioner’s sugar and eat lukewarm, it is even better. Dans un robot, hachez grossièrement les noix (en poudre moyenne plutôt que fine) avec le sucre glace. Dans un bol, mettez le beurre très mou, les noix hachées et les blancs d’oeuf crus. Mélangez bien avec un fouet. Montez les 4 blancs d’oeuf en neige et juste avant qu’ils ne soient trop fermes, ajoutez le sucre en poudre. Mélangez la neige délicatement à la préparation précédente. Garnissez des ramequins de papier sulfurisé beurré et saupoudré de sucre. Remplissez-les avec la préparation (les gâteaux vont légèrement monter), lissez la surface avec la lame d’un couteau, et mettez au four pendant 20 mns (la recette indique 10 mns, mais je pensais que c’était bien trop court.) Attendez 5 mns avant de les démouler. Saupoudrez de sucre glace et dégustez-les tièdes, c’est encore bien meilleur. This sounds really delectable. And I love all the photos you took. Such beautiful photos they are. Great one one this, Bea! Oh Béa, quelles petites beautés. J’adore quand tu les emballes à la japonaise tes gâteaux. J’ai des noix, plein, plus qu’il n’en faut, et beaucoup de gourmandise pour tous les gâteaux aux noix. Je vais les essayer ceux-ci! tes photos sont superbes et la recette de Conticini parfume mon écran de saveurs. I’m so jealous of that kitchenaid! décidément le livre Tentations porte bien son nom!! Oh how I love walnuts. You’re right, they are insanely good for you and what better way to put them to use than in a cake?! Yum! Nice looking cakes. Do you mean “white eggs” (as you have it in the recipe) or “egg whites”? I can’t imagine why it would make a difference if you used brown eggs, for instance. Yummy! 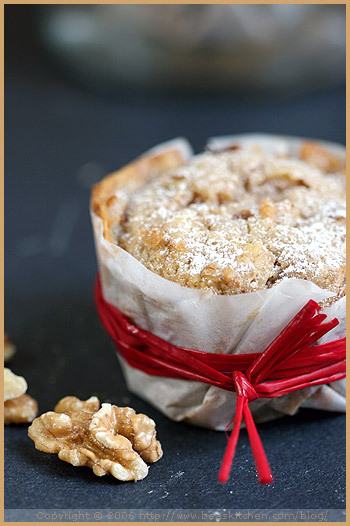 walnuts and cake, what a great combination. You don’t have to press me, Bea! I definitely plan on trying it. It’s so beautiful and I am going through a phase right now where I am very interested in flourless cakes. Bea, these look so good that I showed them to my fiance, the Chef, this morning. He’s starting a new menu for the month on Friday at his restaurant, and I think he’s going to try these for one of the desserts. With warm pear sauce on top. Thanks for the inspiration. I have a 2-pound bag of shelled walnuts. I know now what I’m going to do with them! Ca faisait un bon moment que je cherchais une recette comme celle ci. Merci! La qualite des photos est incroyable. Great job! Que c’est beau! J’en goûterais volontiers un pour mon dessert! Wow, that looks incredible and sounds devine. A perfect bite. I see you have a “good looking blog” but I’ve always know that. Congrats!!! Paris was beyond my dreams – look for something maybe next week. Du vin de noix. J’en frémis! tes photos sont carrément à tomber, bien plus belles que celle du livre dont tu t’es inspirée et c’est pas peu dire !!! car les photos y sont déjà superbes ! Beautiful Pictures! I love cookbooks that all the recipes come out just right. Oh Béa these are truly delightful! I still have a couple of baskets of walnuts unshelled from our tree this year. (tut tut me!) Perhaps this is the inspiration I need! Oh! Bea, the first photo is so gorgeous. The half walnut seems so alive… Trop Cruelle! Mais c’est tellement sublime que l’on te pardonne. Je garde cette recette sous le coude et dès que mes noix seront mangeables, je ferai ces petits gâteaux. Nous profitons des noix tout l’hiver : après les repas, dans les salades, avec le fromage. Pas trop en dessert car je manque de recettes. Certains tartes aux noix sont vraiment très sucrées. Belles photos. Un immense merci pour toutes ces recettes, merci infiniment de prendre le temps de les traduire…Votre blog est formidable! Merci de partager avec tant de générosité vos secrets de cuisine. But don’t you miss those lovely French walnuts? What makes these so special is that you picked the walnuts at your uncle’s…sweet! Cindy, merci, ravie que cela te plaise! Merci de ta visite. Anne, merci. Ce livre est bien! ALhya, oui tout à fait! Dianka, I think it is hard ti beat that, isn’t it? Suzy, thanks so much for spotting the error. Corrected now. Kat, thanks. Glad you like it. Ivonne, Well, with the pastry masteress and baker in you, I am sure I don’t! Shauna, very sweet. I am delighted. I only wished I could taste the Chef’s menu now!! Helen, merci beaucoup à toi de ton gentil mot. Kim, yes I think Aoife would like it! Hi Tanna, welcome back! Cannot wait to see about your trip! Tarzile, eh oui, il ne fait en général pas long feu! Mercotte, merci, tu es trop gentille! Krista, thanks. Yes it was good this way. Bron, nice. I think you will be cooking nice things. Hélène, mmm, tu me donnes l’eau à la bouche rien que d’y penser. Pamela, merci beaucoup de votre message! Ravie que cela vous plaise! David, of course I do! Mais oui! Especially my uncle’s! Picking nuts must give me a great feeling! I haven’t ever picked walnuts, but something similar: I saw a chesnut tree and the nuts dropped allover, that moment already made me jump with joy! Bea, a very splendid recipe! I really love flourless cakes! merci pour cette recette, ils étaient bien bons! I had been absent for a while and how lovely it is to come back here. There is such warmth in your posts. I loved reading this one – went back to check the trip to uncles ( gorgeous photos) and even got so excited that wanted to buy the book. 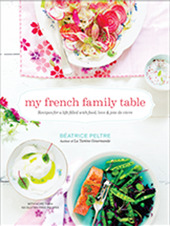 Unfortunatelly French amazon have not got it in stock.I will be making this cake -will schedule it for next weekend. Have a nice week. Tes photos sont toujours tres reussites! Et je suis sure que les desserts sont tres delicieux aussi! Wow, I like walnuts that much. I’ve to try your recipe. Thanks for the inspiration. J’ai rajouté quelques dés de pommes et j’ai apporté tous ces jolis gâteaux à un pique-nique entre amis. J’ai failli ne pas en goûter un seul tellement ils ont eu du succès. Sorry the recipe did not work for you me-cooking. I’ve made it a number of times and it never turned dry for me. In fact, it is quite moist. I wonder what can have gone wrong. Ohhh I just made this cake for my parents, sort of as a tribute to you and yours and as a lovely end to a great dinner. I was so mad at myself because I got some yolk into the whites and they didn’t whip up like I thought they needed to, but this turned out to be a very forgiving recipe. Wonderful flavor, very moist and delectable, and very memorable indeed. My parents and fiance are still raving and we are already fighting over who gets the meager leftovers for breakfast tomorrow… thanks for yet another winner! PS I am setting my alarm half an hour earlier than everyone else so I get the last slice! I love your website. Thank you for making it such a wholesome spot on the internet. I’m a little confused about this recipe. When you say to mix with a whip “two raw egg whites” — do you mean with an electric mixer? As in “to beat”? I like your website and have used some of your beautiful recipes. After reading the recipe for flourless wanut cakes, I was wondering if you can suggest ways of using the 6 yolks that don’t go in these sweets. Thanks. Try to make a creme anglaise or creme brulee.